Sicily is an island in the middle of the Mediterranean Sea, in the heart of a region where wine has been made for over 4,000 years. 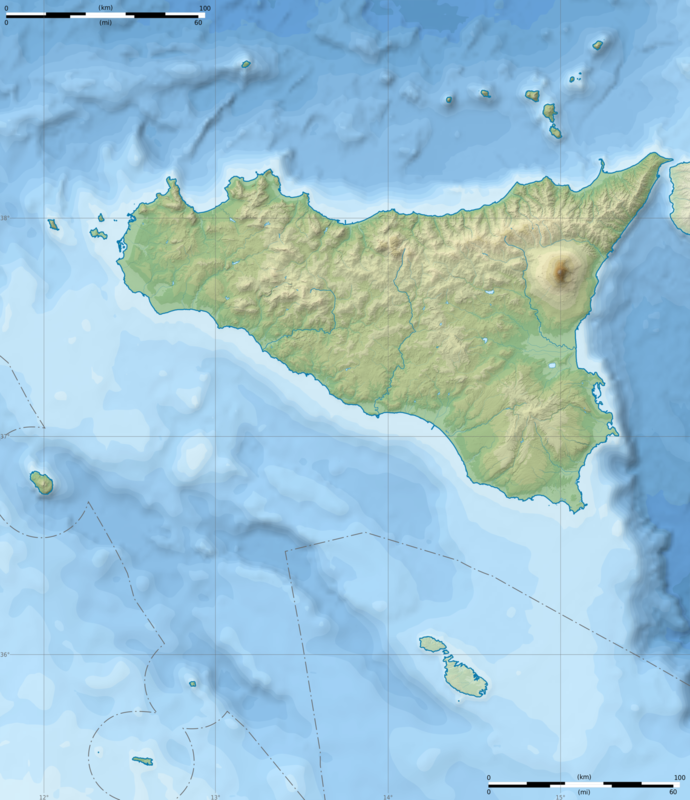 Sicily is a meeting point of cultures which developed in Europe, Africa and Asia and which fused together to form an inseparable and unique fruit. Because of this, when visiting the island, one may encounter people as blond as the Vikings or dark as the Berbers, whilst the Sicilian cuisine is a concentration of the many flavors to be found on the shores of the small sea, or rather large lake, whose name means “in the middle of the lands”. Sicily has preserved its historical centers and the typical nature of ancient European cities, such that often large parts of both its small and larger cities date back to bygone centuries. For instance, Siracusa’s cathedral is essentially the Temple of Athena (built 25 centuries ago), adapted for use as a Catholic church. While Palermo has the largest historical centre in Europe, and maybe even in the world, based on buildings dating back to before XII century. Skyscrapers are noticeable by their absence. The largest cities consist of buildings between two and eight stories, the smaller cities tending to only have buildings of up to four stories high. Typical of nearly all of the centers, at least those dating back to before 1800, is the presence of a castle. 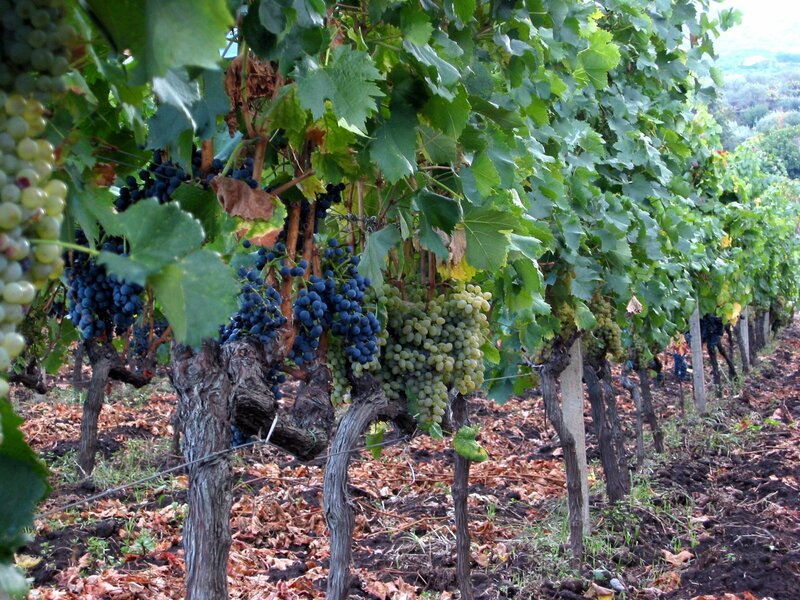 Wine in Sicily has a history thousands of years old. Archaeological remains, in fact, prove the cultivation of vines around 3,000 years ago, and it is not by chance that one of the largest ancient wine cellars known today is to be found close to Agrigento. This wine cellar was in operation 2,400 years ago when Archestratos was writing in Siracusa the first ever book dedicated entirely to gastronomy, transmitted to us. According to a modern day winemaker, all the wine grapes coming from the Middle East and Greece, passed through Sicily and then made their way north. We don’t know if this was in fact the case, however it is certain that even today hundreds of different grape varieties are cultivated in Sicily. Our has its own vineyards in Noto, a city famous for both history and art, with great wine-making traditions which still remain today. In 2002 Noto has been included in the World Heritage List of UNESCO. Our vineyard, or rather vineyards (you will see why below) are located in the countryside around Noto, in a place aptly called “Contrada Buonivini”, which means “land of fine wines” (this is its real name, we didn’t name it such), in an area renowned for being one of the best in Sicily for producing great red wines, not far from the beautiful Villa del Tellaro. A land bathed in sun, far from inhabited areas and industrial works and therefore from the pollution that they cause. The vineyards are just a few kilometers from the sea, at an altitude of between 40 and 60 m.s.l. This proximity to the sea, which during summer guarantees an almost constant breeze, is extremely beneficial to the health of the grapes, in addition to restricting the use of phytosanitary products. The soils are predominantly clay, with a total limestone content greater than 50% and an active limestone content equal to around 11%. The composition of the soil vary, however, there being white (scarce and without vineyards), reddish, grey and black soils. The vineyards (one begins to understand the plural now) extend over an area of around 14 hectares (35 acres). The Vertical Trellis vines are from 12 to 25 years old and have a vine spacing of 1,80 m / 6 ft. between rows and 0,85 m -3 ft. between plants, with a consequential vine density of around 7,500 plants per hectare (3,000 per acre). Spurred Cordon, which have 4 to 5 shoots per plant, each of which has two grape clusters. Guyot, which have around 8 shoots per plant, each of which has two grape clusters. The fruit-bearing shoots are, on average, 70 cm above the ground. The rootstocks used are different, both due to the various different soil types in which they are grown, and in order to produce grapes with subtly different characteristics, which give an organoleptic richness to the wine. These rootstocks are traditional: Paulsen and Ruggeri, as well as more modern. 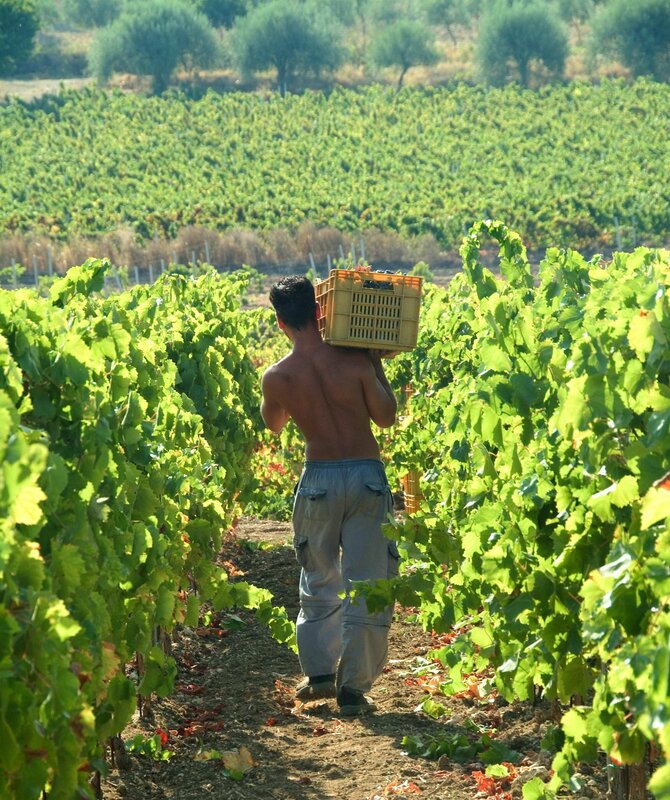 The grape picking usually takes place in September, although it can be a week earlier to one week later, depending on when the grapes reach optimal maturity, which changes slightly according to position, soil and type of cultivation. The harvest is manual. The grapes are collected in small crates. 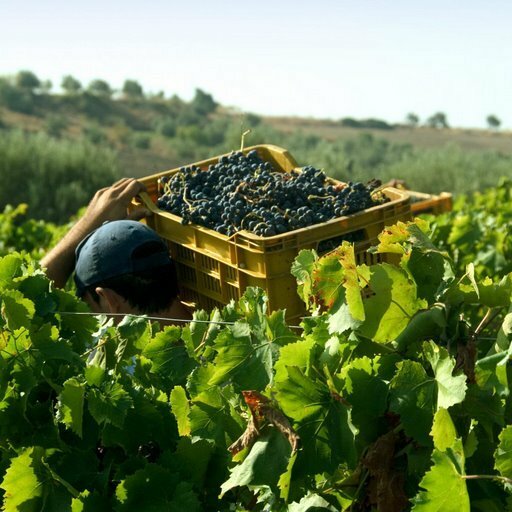 And as ancient traditions dictate (dating as far back as the Greeks), the cultivation of vines goes along with that of olive trees and wheat fields and … this is also the case for us. Fruit trees (figs, almonds, apricots, carobs) are scattered here and there, while dwarf fan palms add their untamed charm.